As a life-long resident of Edinburgh with a spell of study and work in London, I am always amazed by the words and local sayings we use here and take for granted, that leave the good visitors to our Fair City baffled as to their meaning, wondering whether we do indeed share a common language. Here’s a little story…. There are numerous words that perhaps need translation for the visitor to Edinburgh to understand the locals and maybe have a wee laugh at our expense! 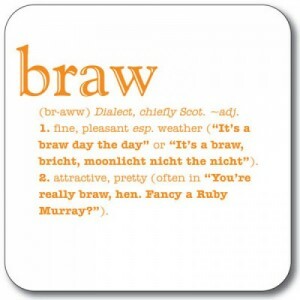 And just for good measure some local sayings too! We’re a’ Jock Thomson’s Bairns – We’re all the same in God’s eyes. Lang may yer lum reek – May you always have good health!